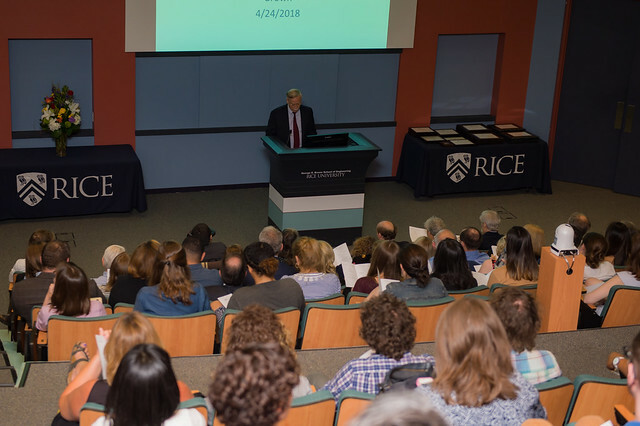 As the recipient of last year’s George R. Brown Prize for Excellence in Teaching – Rice University’s highest teaching award, James Brown reflected on “unsurpassed” teaching and learning when he presented the 2018 Brown Lecture on Teaching Excellence April 25 to a standing room-only crowd in Duncan Hall’s McMurtry Auditorium. He is a professor of economics in the School of Social Sciences. As the recipient of last year’s George R. Brown Prize for Excellence in Teaching – Rice University’s highest teaching award, James Brown reflected on “unsurpassed” teaching and learning when he presented the 2018 Brown Lecture on Teaching Excellence April 25 to a standing room-only crowd in Duncan Hall’s McMurtry Auditorium. Photo by Jeff Fitlow. The lecture was part of the annual University Awards Ceremony, hosted by Rice’s Center for Teaching Excellence (CTE). Brown was introduced by his colleague, George Zodrow, the Allyn R. and Gladys M. Cline Chair in Economics. “It’s certainly a great pleasure to introduce Professor James Brown,” Zodrow said, noting that Brown really needed no introduction as he had stood on the podium “many times before.” His numerous teaching accolades over the years include the George R. Brown Award for Superior Teaching in 2004, 2006, 2007 and 2013 and the George R. Brown Prize for Excellence in Teaching in 2009. Brown was also honored with the Sarah A. Burnett Teaching Prize in the Social Sciences in 2010. Zodrow noted that over the years, he’s had the pleasure of looking at Brown’s student evaluations and said they are the most laudatory he has ever seen. He then read one to the audience. Audience members applaud at the 2018 University Awards Ceremony. Photo by Jeff Fitlow. Although the notion is subject to differing interpretation, unsurpassed teaching serves as a concept worthy of aspiration to the extent that it reflects the desire to excel in serving students, Brown said. Brown said he personally interprets the notion of unsurpassed teaching as simply trying to teach each semester and each class better than he has before, but emphasized that judging whether he had met even that modest goal was difficult. Noting that students differ in the type of instruction that would be best for them individually, Brown said that in choosing the pace of the course, complexity of his lectures, frequency and difficulty of exams and the myriad other factors that exist in the teaching of every course, these decisions inevitably involve trade-offs with regard to how well different students learn. To individualize instruction as much as possible and make sure his students grasp course material, Brown makes every effort to be available for them. As his students often note, this includes providing his cell and home phone numbers so students can get in touch with him and receive help on short notice at almost any time. It also includes regular Sunday afternoon review sessions, extra weekly lectures (a recent innovation) and extensive hours of availability outside of class. Brown noted that his efforts are supplemented by a large group of undergraduate volunteer teaching assistants, who generously provide almost unlimited on-campus assistance at night. Brown said that he also strives to make teaching more than just presentation of course material. “Teaching should be personal,” he said. Brown said that, ultimately, he has always believed that if a teacher wants to teach and really cares about a student’s learning and the student wants to learn, good things will happen. “We’re really fortunate here at Rice that the university has brought together so many teachers who really want to teach and so many students who want to learn,” said Brown, who also received the George R. Brown Certificate of Highest Merit. Following Brown’s lecture, the 2018 University Awards were presented. Winners were announced in the April 23 edition of Rice News and can be found here. Rice President David Leebron addressed the attendees, congratulating the award winners and commending them on their “extraordinary” sense of dedication to Rice’s students. “Today is one of those days you feel distinctly privileged to be a member of this community,” he said. For more information on the Center for Teaching Excellence, visit http://cte.rice.edu.